Poll: In How Many Years Will Online Holiday Sales Exceed Brick-and-Mortar Holiday Sales? It’s hard not to see a massive cultural and demographic shift underway in holiday sales this year. For example, most of the developed economies are aging and the older generations are shifting more of their monies toward retirement and health care. Meanwhile, younger generations now seem comfortable with the online shopping experience as compared with their parents and grandparents. These trends have culminated in drops in bricks-and-mortar shopping on “Black Friday” and increasing spending on Cyber Monday. When will the Monday exceed the Friday? A majority of respondents to the CFA Institute Financial NewsBrief poll believe the shift is irreversible since only about 23% believe the transition will never occur. Among the believers, almost half think the change will occur in less than five years. 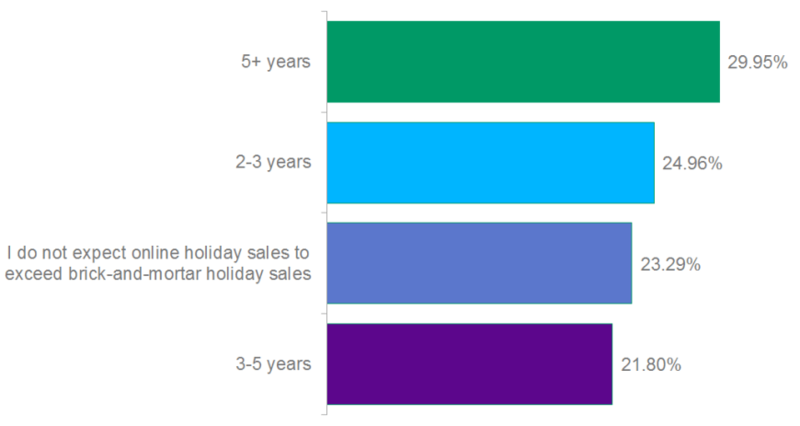 In how many years will online holiday sales exceed brick-and-mortar holiday sales? For investors there are many ramifications, such as changes in real estate builds and asset pricing, capital spends on logistics, profits at financial companies, and even Internet bandwidth.